Qedit for Windows 5.4 offers the following enhancements and fixes. You can specify a maximum line length on the Open Host File dialog box. As the file is read, the server breaks down lines. This is mostly useful for files that do not have Newline delimiters but works equally well with other files. This is available for HP-UX connections only and requires version 5.3.13 of the server. 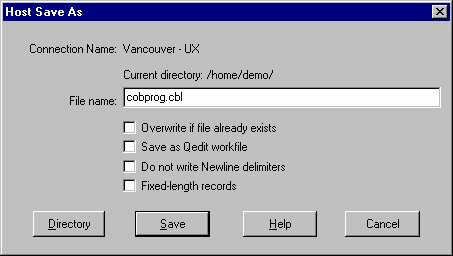 The Host Save As dialog box has 2 new options: Do not write Newline delimiters and Fixed-length records. The first option allows the creation of a file without Newline delimiters at the end of each line. 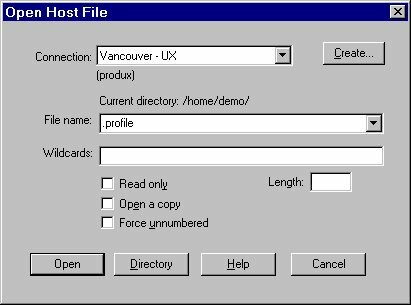 The second option allows the creation of a file in which all records have the same number of characters. This is available for HP-UX connections only and requires version 5.3.13 of the server. Qedit is able to recognize the CobolFixed server setting. When enabled on the server, this forces all Cobol source files to be saved with fixed-length records. The server setting is displayed on the Information page of the File Properties dialog box and requires version 5.3.13 of the server. The HP-UX server does a better job dealing with supplementary groups and related permissions. This is fixed in version 5.3.13 of the server. If the server cannot open a file, the error message is displayed and the Open Host File dialog box is brought back automatically. The user can correct the information and try again immediately. If the connection is not open (trying to open the first file) and the Close connections with no open files option is enabled, the second open attempt will re-open the connection. When a new connection is established, Qedit tells the server which passwords were stored in the connection template and which have been prompted for. The server then sets environment variables, QEDSTOREDPWD and QEDPROMPTEDPWD respectively, with these values. This worked with the Firewall Protocol option on HP 3000 servers and all HP 9000 servers. The feature now works with HP 3000 servers using the default protocol. The information is sent to the server by the way of arguments (-e and �i) in the INFO= string. The field order when tabbing through the Replace dialog box goes from top-left to bottom-right. The default button is now Replace instead of Cancel. There are cases where the client's view of a file was different than what was actually on the server. This was a problem in the server and it has been fixed in version 5.3.12. The following is a list of smaller changes or bug fixes in this version. Undoing a column edit operation (delete, insert, shift) on a host file sometime caused the server and client undo stacks to become out of sync. This could lead to various problems including client aborts. The caret remained visible after a search on a host file. Syntax coloring does not go away anymore after doing a Revert to undo all the changes done to the file. Qedit sometimes aborted trying to load application icons. This has been fixed.